9. 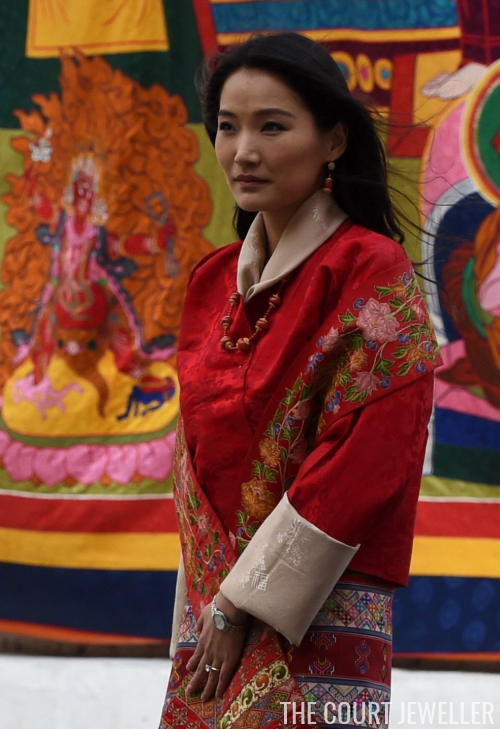 To welcome the Duke and Duchess of Cambridge to Bhutan on Thursday, Queen Jetsun Pema wore a beautiful beaded necklace and coordinating earrings. 8. Kate's been surprising us with lots of new jewels during this tour (see here for a look at all of them! ), but two pairs have really stood out to me. The first was a pair of Kiki McDonough earrings made of green tourmalines, green amethysts, and diamonds; they were reportedly made to celebrate the birth of Princess Charlotte last May. Kate wore them on Tuesday for a meeting with Prime Minister Modi of India. 7. 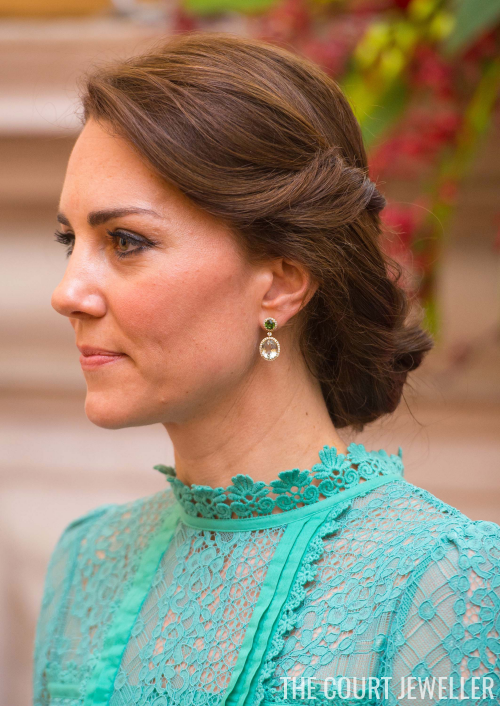 My other favorite pair of Kate's earrings during the tour so far have been the lapis and diamond sparklers by Amrapali. Kate wore the earrings for a charity gala in Mumbai on Sunday. 6. 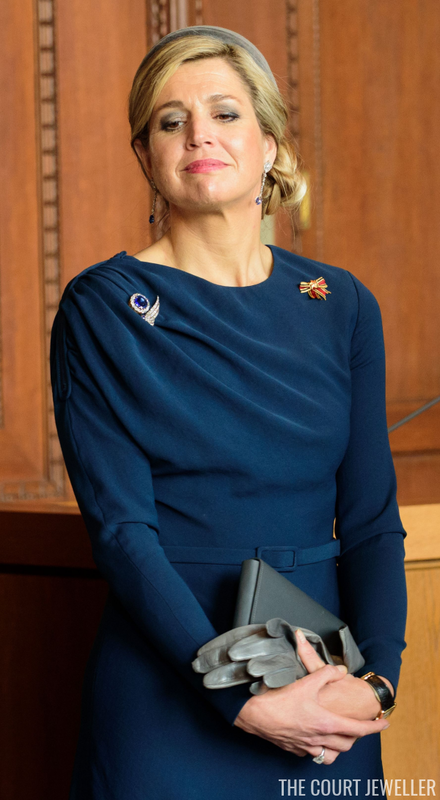 Queen Maxima of the Netherlands has been on a visit to Bavaria this week, and on Thursday, she wore glittering diamonds and sapphires for engagements in Nuremberg. 5. On Wednesday afternoon, Maxima pulled out all of the diamond studded stops, wearing a diamond riviere, bracelet, and earrings in Munich. 4. 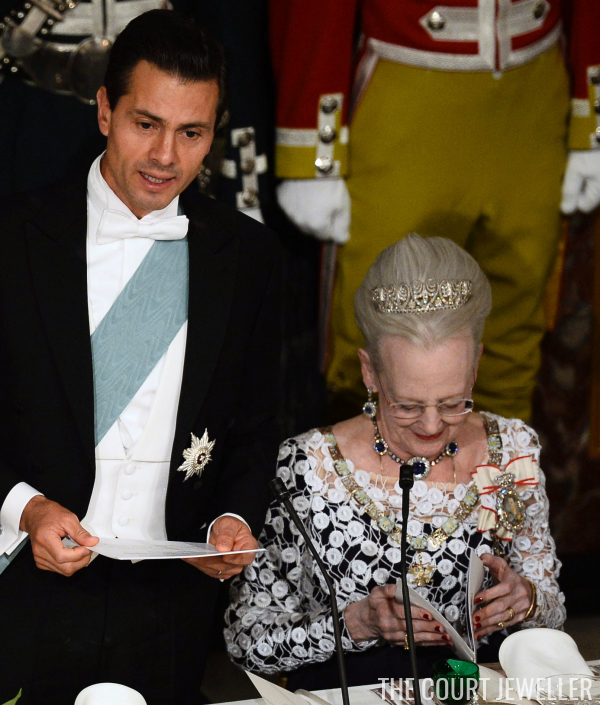 Princess Benedikte of Denmark persevered through the rain during her arrival at the state banquet for the President of Mexico on Wednesday. For the dinner, she wore her floral birthday tiara with pearls. 3. 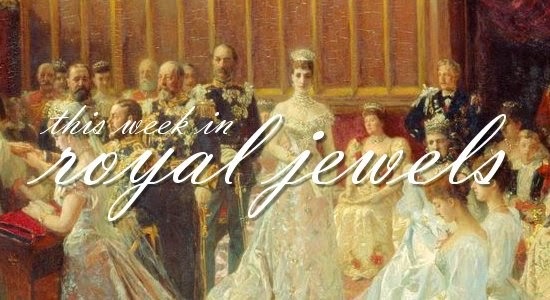 Princess Marie of Denmark didn't give us any huge jewel surprises for the state banquet: she wore her usual sparkler, Princess Dagmar's Floral Tiara. 2. Crown Princess Mary of Denmark showed an increasing fondness for her Edwardian Tiara, wearing it yet again at this week's state banquet; however, she did swap out the coordinating earrings for a different pair. 1. 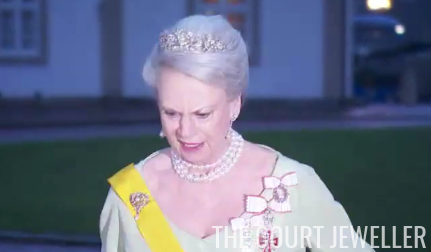 My top vote of the week goes to Queen Margrethe II of Denmark, who pulled out not only the Baden Palmette Tiara but also Queen Alexandrine's sapphires for the state banquet. Bravo, Your Maj!